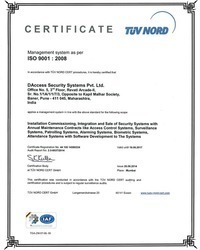 Established in the year 2006, DAccess is involved in supplying of security and surveillance equipment like video surveillance systems, door security device, magnetic lock, PIR sensor, hidden spy camera, night vision camera, heat detectors, alarm security systems, time attendance systems along with providing respective solutions. We are also providing web solutions like website designing and software development. DAccess stands for Digital Access Control System. We strive to help various organizations in improving and enhancing their profitability and productivity through our technology-based security and integrated solutions in the field of office automation, quality control automation and biomedical applications. We believe that this is the one of the logically driven ways out to become the world's leading solution provider using biometrics, RFID, image processing and other related technologies. We have an objective of constantly delivering high quality products, solutions and services exceeding our clients’ expectations. Our solutions are meant to provide assistance to our customers in enhancing their productivity and growing their businesses. This helps us in establishing long term business relationships with them and in due course achieving our strong hold on reliability and repute in the market. With a plethora of products and long term operational goals and advantages, we, at DAccess provide organizations the technological edge to improve their security and profitability through intelligent office automations, quality control automations, biomedical and security solutions and the works. Apart from automated security solutions, we pride ourselves into Custom Software Development that includes Customized Design and Development, Payroll Software, Embedded Solutions and lots more. If you have a business, and feel the need for your brand to send the right message across, then our Customized Web Design and Development team will chalk out the right blueprint and get upto speed to deliver the right product for you and your brand. With a customer driven mind-set, we at DAccess provide innovative solutions to serve our esteemed clients with better support services and various distribution collaterals. We constantly strive to deliver high quality products, solutions and services that exceed customer expectations. 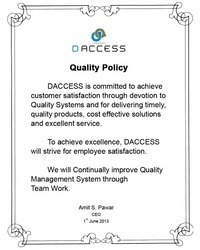 At DAccess, we redefine the definition of Application Technology, Safety, Quality, and Performance and in turn increase customer satisfaction, long term business relationships and strong market credibility for our company. 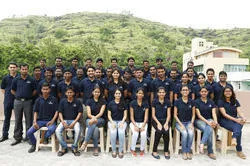 We have our dedicated service team which provides on-site services, tele-maintenance, remote administration and remote diagnostics regarding our services and product solutions. The remotely addressed services are monitored from our central control center at Mumbai. We carry out our operational activities with our well-established official premises at different locations across the country. 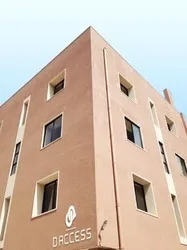 Our head office is based at Pune, Maharashtra. Our other two regional offices are located in Mumbai and Daman. 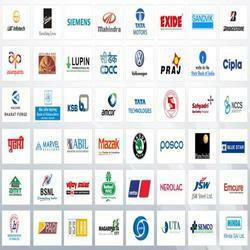 These offices have tie-ups with a widespread dealer network across all over India. Backed up with enhanced infrastructural framework, we are efficiently able to offer complete package solution for secured access, attendance, payroll, HR management and other office automation processes. With our “Embedded” branch's marketing ground in various organizations related to different businesses, schools, colleges, offices, shops etc, we provide cost effective solution to them with utmost perfection and suitability. Our products and solutions are distributed directly through our prompt and effective dealer network all over. In present day scenario, every organization is willing to implement security and automation solutions in their framework based on latest technologies. With little bit ignorance at initial stage, we have now emphasized our operational approach in providing these solutions in due return of increased demand from corporate sectors across the globe. To attain maximum credibility, we have worked on technical upgradation and training our efficient workforce. Our world-class products and services have led up achieving a wide base of clientele from all across the globe.